The 2002 outburst of V838 Monocerotis was one of the major hits in stellar astrophysics in recent years. This object is the most studied member of a class of rare stars undergoing tremendous explosions, so powerful as to make V838 Mon at peak brightness one of the most luminous stars in the whole Local Group (Mv = -10 mag). After the outburst, V838 Mon expanded to hypergiant dimensions while cooling down to the brown-dwarf temperture regime. The progenitor of V838 Mon must have been massive and young, given the presence of a normal B3V companion and its likely location inside a young stellar cluster. In addition, the energetic outburst and the presence of a large amount of material around V838 Mon produced a sensational light echo, the first in our Galaxy for many decades. This light echo has become so large and bright as to be easily observable with backyard telescopes, while the Hubble Space Telescope followed the details of its spectacular evolution (see the front cover picture). The story is not concluded yet, and as this volume goes into press V838 Mon is calling once again the attention of the astronomical community with new unexpected events, like the flaring of an extremely rich and intense iron emission line spectrum at the end of 2006. 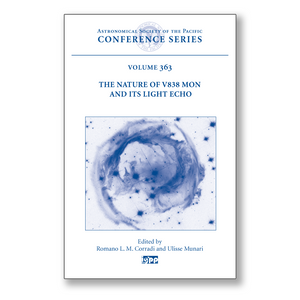 This volume collects and discusses what we know so far of this rare and intriguing star, and hopefully will pave the way to future, detailed studies that will incorporate the analysis of the advanced evolution of V838 Mon.